This baseball is a truly one of a kind find! It is unlikely a ball like this is available anywhere else on the open market - or any market, for that matter. Official Major League Baseball featuring the authenticated signatures of 3 members of the National Baseball Hall of Fame and the ultra-exclusive 6,000 Total Bases Club. 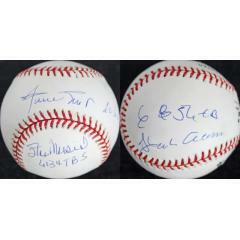 Autographs on this ball are those of Hank Aaron, Stan Musial and Willie Mays. Each player inscribed his career total bases number with his signature. 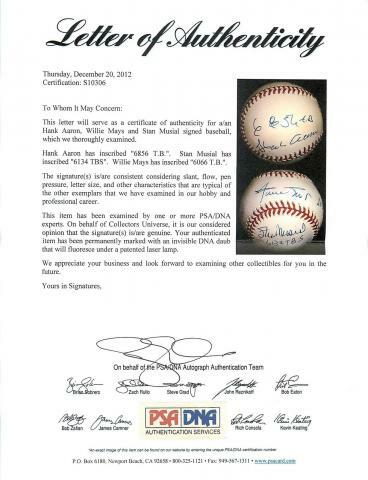 This ball comes with a Full Letter of Authenticity from PSA/DNA. Add this amazing piece of game history to your collection today! Due to the very rare nature of this item we must charge your credit card for the full amount immediately upon taking our order. This policy ensures we reserve the ball for you. We will confirm your order by Email. This ball is not game used. Please allow 2 to 4 weeks for delivery.